Aladdins Gold Casino Review (2017) - 200% Bonus up to $14K! Established in 2009, Aladdin’s Gold Casino is yet another online gaming site owned and operated by The Club World Casino Group. Licensing is provided by the Curacao government as well as the Kahnawake Gaming Commission, which also allows for players from the United States to take part in real money online casino gaming. Software is provided by Real Time Gaming, which offers an amazing selection of slots, table games and more. Aladdin’s Gold can be played in three forms: Instant Play, a downloadable version and via your mobile browser. Switch back and forth from each option depending on if you are on the go or just want to enjoy the casino from the comfort of your own home. Customer support is offered around the clock with Live chat, telephone and email options for any questions or concerns. The Welcome Bonus offer at Aladdin’s Gold is quite generous as they offer new players up to 200% in bonus cash – with one caveat – the 200% will be applied to your first 7 deposits from the first day you fund your account (only up to 7 days though). This 200% deposit bonus will be applied to slots game play, along with keno and scratch cards. The deposit plus bonus amount will need to be wagered 30x to ensure the winnings are able to clear. You can redeem this bonus 7x for even days from signup. For players who enjoy other table games, there is also a 100% welcome bonus available. Earn 100% back while playing all games except baccarat, craps, roulette and sic bo. This bonus is also offered 7x for 7 days after signing up. There are additional bonuses and incentives offered at Aladdin’s Gold to keep you in the money. For each day of the week, the casino offers a special coupon which will give you access to a special bonus. Simply check the website for all the promos available as they are constantly updating them to keep customers happy and coming back. On Monday’s, use the code SULTAN to earn 3x 65% deposit bonus for blackjack and video poker. On Tuesdays, you will have access to a slot game bonus of 3x 67% bonus for your deposit. Continue each day to take advantage of all the extra bonus options provided by the online casino. Aladdin’s Gold operates via the software provided by Real Time Gaming, a top software company in the online casino business. Players can choose to download their software for access to all games provided by RTG or simply log in to your account on the Aladdins website and start playing directly from your browser – it’s THAT simple. The site is also mobile-friendly and is fully accessible on the go. The look of Aladdin’s Gold is quite unique and based on the story of Aladdin. Purple and gold coloring are used to keep in line with the theme with fun images of Aladdin, the Genie and even Jasmine found on the site. When it comes to gaming options, Aladdin’s Gold offers several categories of casino favorites. The two largest categories are Table Games and Slots. The table games section includes traditional favorites like baccarat, blackjack and Caribbean stud poker. They also have other games, including Match Play 21 and Vegas Three Card Rummy. As far as slots are concerned, the choices are vast. Play the Standard 7’s and Stripes game or the ever-popular Aztec’s Millions to hopefully earn a huge jackpot payday. With over 120 games to choose from in their overall portfolio, you will find Aladdin’s Gold has something for every player. Additional gaming categories include: Video Poker, New Games, Specialty and Progressives. Aladdin’s Gold makes it easy for you to deposit funds to get started playing your favorite games. Find methods that meet your needs for deposit and withdrawals to be able to fund your account as well as cash out once you earn a big win. Customer support is important to Aladdin’s Gold, so the online casino makes sure that support techs are available 24/7. Access assistance immediately with the Live Chat feature or speak to support via 1-866-465-7285 for US residents and (+44) 0870 266 8801 for international players. Email options are also offered on the site. 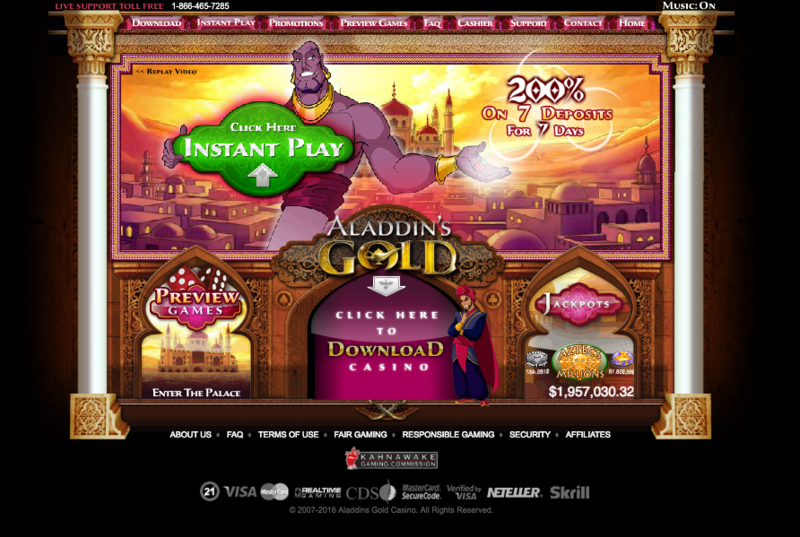 Overall, Aladdin’s Gold offers a unique theme to the classic online casino experience. Enjoy quality graphics and animations whether you play the instant, downloadable or mobile version of the site. New members will find Aladdin’s Gold offers a secure environment for quality casino gaming including table games, slots, progressives and more. Easily sign up and take advantage of all their unique bonus options and start playing your favorite RTG games.